An elegantly polished two stone ring of London blue topaz and sparkling diamond have been handcrafted and casted in 14 carat white gold to create a show stopping ring. Measuring 6mm with a total carat weight of 0.13, this ring in white gold sits delicately around your finger. 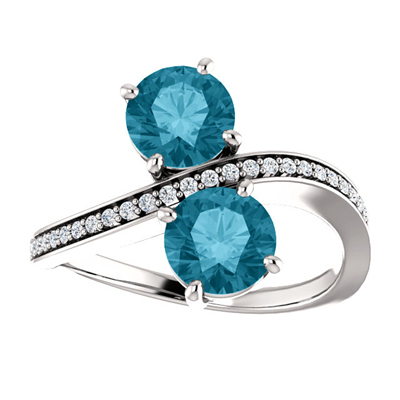 g of London blue topaz and sparkling diamond have been handcrafted and casted in 14 carat white gold to create a show stopping ring. Measuring 6mm with a total carat weight of 0.13, this ring in white gold sits delicately around your finger. We guarantee our London Blue Topaz and Diamond Two Stone Ring in 14K White Gold to be high quality, authentic jewelry, as described above.